Last night I made one of our family's favourite dishes and thought I should share my recipe with you. I always loved Singapore Noodles from the local Chinese Restaurant and it took me quite a few goes to find a recipe i liked. By the time i'd finished changing it for ease of cooking and to suit my taste it barely resembled the original recipe at all! Cook noodles in a large saucepan uncovered, until just tender, drain. Spray a large frying pan or wok with oil and cook the eggs in a couple of batches to make thin omelettes. Once cooked, roll omelettes and cut into thin strips, then set aside. Spray pan again. Stir-fry onion and garlic until onion softens. Add paste and stir-fry until fragrant then add chicken, carrot, capsicum and sauces and stir-fry for a couple of minutes. Add noodles, shallots and omelette, toss to combine and heat through. NB. Green prawns make a yummy addition if you have them and I usually keep a small amount of the plain noodles set aside to add to Master 7's meal, as he's not a huge fan of anything too hot! Hope you like it Peg....let me know how it goes! 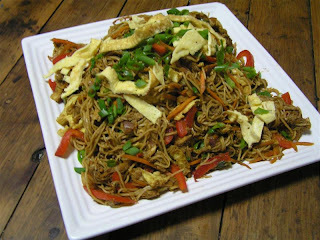 I made your Singapore Noodles on Saturday afternoon, it was such a hit, my fiance had two servings which is a rarity!! Two thumbs up for Thimbelina!!!! !